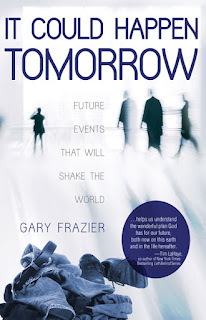 I will admit: Gary Frazier's book IT COULD HAPPEN TOMORROW from New Leaf Press is NOT the typical kind of a book about spirituality, faith, or Christianity that I find myself reading. I have become burned out on books about end-times prophecies that are either sensationalized or full of nothing but the author's opinions or creative liberties. Most of the time, Christian-themed books about the end of the world come across as either works speculative fiction that minimally have any kind of Biblical foundation, or else they read like the manifesto of an individual who is clearly suffering from some form of mental instability, because they "know" and can "accurately predict" moments which will lead up to the Rapture. Thankfully, Frazier's book is nothing like that. Utilizing the interpretation of Scripture found in the NIV, the author manages to show the balance between Old Testament prophecies, the visions recorded by the Apostle John found in the Book of Revelation, and all subsequent relevant passages found in the Bible. The volume of predictions found in Scripture and laid out by the author that show such a concise flow of and chain of documented and verifiable events that are centuries if not millennia apart from when first predicted and what actually transpired should give the reader pause to rethink their own opinion about the End Times, even of the reader is not a believer in Christ. The book is relatively free of editorialized or biased opinions and instead is quite possibly the closest thing one can get to a bias-free study of Scripture and historical events which are set to lead to the Rapture. I only furrowed my brow and grunted slightly at a couple of the accusations made by Frazier which seemed to come out of nowhere other than to "zing" a few modern ideas and beliefs; for example, I personally had an issue with the implication that EVERY aspect of either the Emergent Movement or Black Liberation Theology is inherently "Satanic." While there are undoubtedly components and individuals involved in each movement which are not entirely Godly, the same argument could be made for any traditional church. But I digress. The book itself is good for individuals who are confused and unsure about all the various terms and ideas surrounding the End Times, because the author does an outstanding job of clarifying and codifying almost every key aspect, but a minimal baseline of knowledge about Biblical prophecy and Biblical history would be good to have going in to reading this book. This is not the text to hand to someone who is not a believer in Christ. This IS a good book to hand to someone who may have grown up in the Church and have heard these ideas all their life but not have the first clue of how they all fit together, or what any of them mean. I received a copy of this book for review from the publisher but the opinion of it is my own and was not solicited, nor was a positive review required.